Black swallowtails. These large butterflies are named for their color and the shape of their tails. Female (left) and male (right) look different. Females have a large blue cloud on their hind wings. Males sport an inner band of bold yellow spots across their wings. Black swallowtail butterflies are one of the joys of July – and the rest of the summer as well. But butterflies come from caterpillars, and all of us aren't crazy about those. 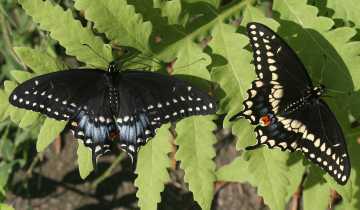 Eastern black swallowtail butterflies (Papilio polyxenes) have adapted relatively well to the sorts of changes that human development has made in the landscape. These butterflies like open areas, such as fields, power cuts, roadsides, and suburban gardens. Ready for change. After growing to about two inches long and shedding its skin four or five times, this black swallowtail caterpillar has finally stopped eating. 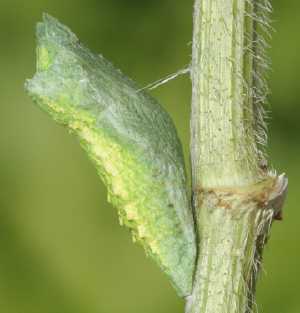 It is now in position to form a chrysalis. It has already fastened itself to a sturdy stem of Queen Anne's lace with a thread of silk around its middle. It's not hard to meet a black swallowtail caterpillar. They're otherwise known as "parsley worms." If you have parsley growing in your garden, or even in a pot on your deck, perhaps you've already met a few. The caterpillars that are large enough to notice are typically striped green, black, and yellow. Like other butterflies, eastern black swallowtails need to be particular about where they lay their eggs. Their caterpillars eat only certain plants. Plants in the carrot family (Apiaceae or Umbelliferae) fill the bill for black swallowtails. These plants include parsley, dill, and carrots – home garden fare – as well as Queen Anne's lace (Daucus carota), a non-native wildflower that has become widely naturalized. It's no accident that both parsley and Queen Anne's lace have a place in the WCLT butterfly garden at the Andrews Street entrance to the Headwaters Conservation Area. Metamorphosis! Safe inside this chrysalis on a Queen Anne's lace stem, a remarkable transformation takes place as the caterpillar turns into a butterfly. Its organs dissolve and reorganize. In summer the change takes a couple of weeks. If it's late in the year, the black swallowtail will spend the entire winter in the chrysalis stage. If you find parsley worms in your garden and don't feel like sharing, you can always move the caterpillars to some roadside Queen Anne's lace. That way you'll spare them and they'll have food to eat to grow into butterflies. Black swallowtails lay their eggs one at a time in different places, so there usually aren't large numbers of caterpillars to overwhelm a garden. Hanging wings out to dry. 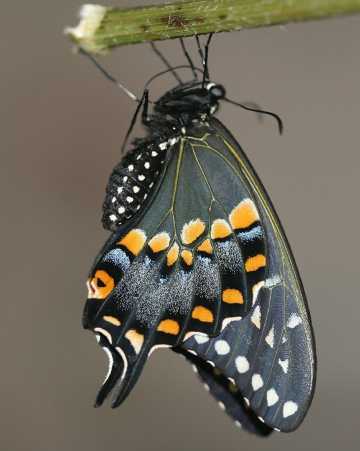 After emerging from its chrysalis, this black swallowtail butterfly hangs upside-down from a stick. Gravity helps it to pump fluid into its wings. They must expand to full size and then dry before the new black swallowtail butterfly can fly. 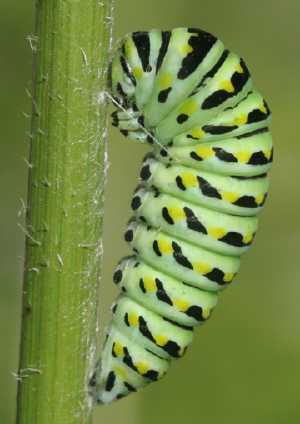 You might enjoy watching the black swallowtail's progress from "parsley worm" caterpillar to butterfly in your garden. Or check out the accompanying photos. To find black swallowtail butterflies in Westborough, the fields at Mass Fish and Wildlife are a good place to go. Queen Anne's lace is in bloom there, along with other wildflowers that provide nectar for many kinds of butterflies. Or keep an eye out in your own yard. That black butterfly that flits by so quickly is probably a black swallowtail.